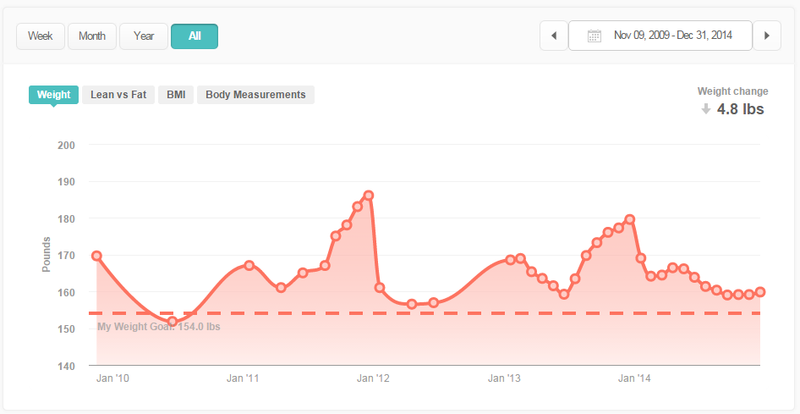 2014 has been a roller coaster of a year for me when it comes to my weight. 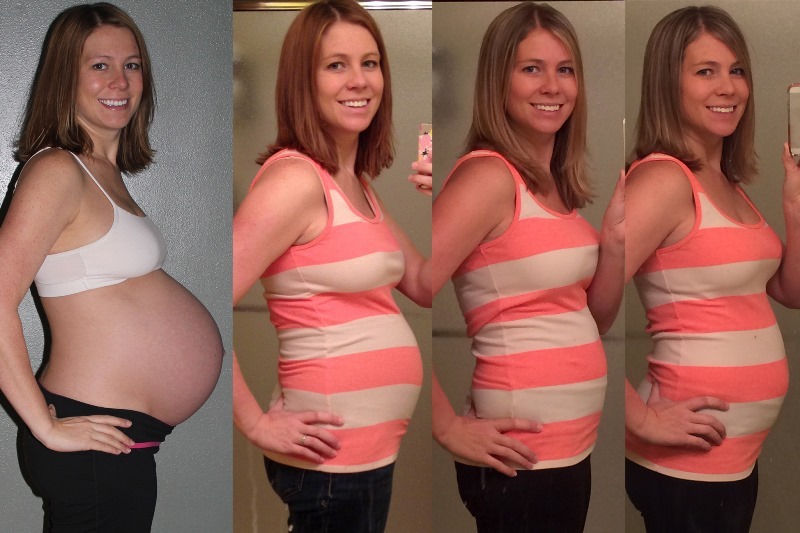 I started out the year miraculously 9 months pregnant with my second child (yay!) and gave birth on January 12th weighing a healthy 181# (a gain of 20# on my 5’8″ frame). I lost 19# of that in the first 2 months before my weight started creeping back up thanks to eating & drinking my way through grief after my sister-in-law died in March, and I got back up to 168# before getting a handle on things. Then I spent the last 4-5 months of the year hovering around 158# (a couple of pounds below my pre-pregnancy weight of 161#), which I was okay with since I’m still breastfeeding. The final 2 weeks of the year I was on vacation and put on 6 DAMN POUNDS, so I’m annoyingly ending the year at 164.8# with a very bloated stomach, but I’m sure with a few days of clean eating & water chugging I will drop at least a couple of those pounds (since I’m praying at least a bit of that is alcohol & travel bloat since we just got home yesterday!). Well, other than my charger dying for part of the month, I can tell I did okay with this goal. I didn’t hit 7,500 every day by any means, but I started creeping my step average back up there, especially considering I was on vacation & traveling the past 12 days. I’m going to continue working on being consciously active, even though it’s freakin’ freezing cold outside right now! 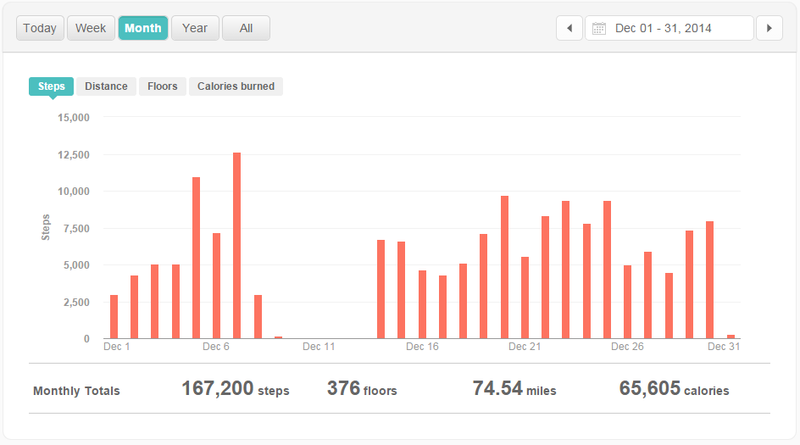 Daily steps in December – working on increasing my daily movement, even though it’s cold out! I didn’t track on a calendar, but I did pretty great at this! On vacation I even did a 2 hour long swims (laps), 2 elliptical workouts, and one exercise video. Not bad for having 9 days on the ground and relaxing! I didn’t track food at all. Oops. I did eat mindfully in CO, but while in MN…well, not so much. My food choices were decent, but we drank beer after beer after beer while on vacation. It was super fun – but not so great for the waistline. Seriously – I’m up 6# in 2 weeks. That’s ridiculous. Sleep at least 8 hrs/night. This is partially dependent upon the kids, partially dependent upon me going to bed early enough to make it happen. Sleep is so important to health though, and I’ve been letting that slide! I was great about this for the first 3 weeks, not so great the past 12 days. Travel & vacation did a number on my sleep, though even with the late nights (11-12 instead of 9pm), we did get a few comparatively late mornings (7:30 instead of 5:30-6:00) thanks to the kids sleeping in and/or my parents helping out, so that was nice! Keep my weight in the 157-158# range. Once Harvey hits 1 year on Jan 12th & I’m not worried about my milk supply, I’m going to ramp up on my weight loss & fitness goals though! I stayed in the 158s the entire first 3 weeks of the month. I just weighed myself this morning for the first time since the 19th and it was 164.8#, which is more than a little annoying to me. (Yes, it’s my own fault.) At the same point, I know that I am in a great head space to change things up at this point, so starting tomorrow I am back to eating healthy, cutting back on alcohol, and working out consistently. I want to feel great in my clothes again! My plan is to take this next week to think about what I really want for my life (health-wise) out of 2015. I’m thinking of different challenges & goals to post about to keep myself accountable, and I plan to write about it all next Wednesday during my WWW. Even though most people don’t comment on these posts, I thank you all for being out there in the world to keep me accountable when I post my fitness goals on the world wide web! Until then, I wish you all a Health and Happy New Year!! I gained 3-4 pounds between 12/23 and 12/31. I finished yesterday missing my weight and body fat goals. I’m deflated, BUT also not down on myself because its the holidays. We sometimes need to cut ourselves some slack. Here’s to a healthy 2015 for you! 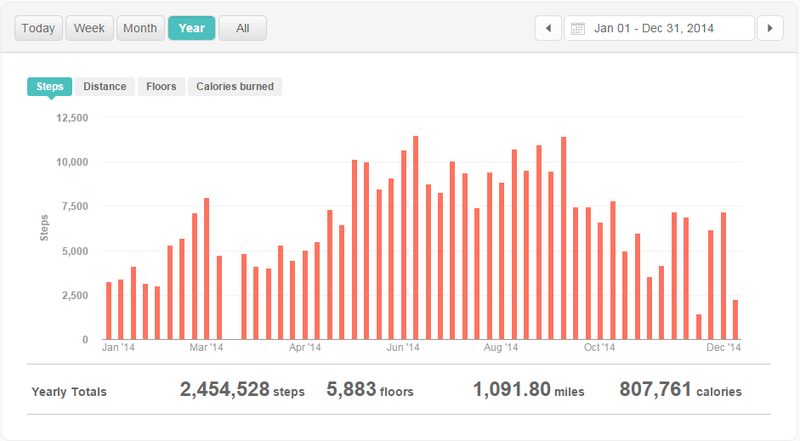 I had a fitbit for Christmas. How do I find friends to help challenge me to up my steps goals? Ripped in 30 tomorrow? See you there? Ripped in 30 – I started yesterday, and I’m down for it again today as well. You and I are going to crush that video this month!